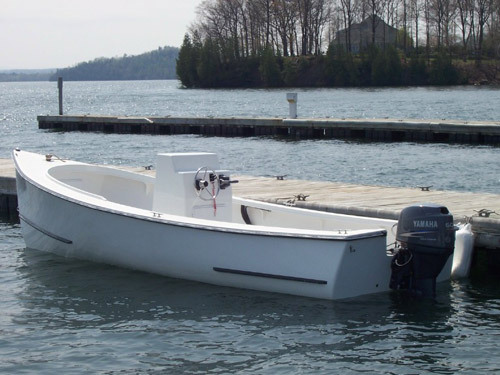 In business since 1984, Flying Point Boatworks is a builder of traditional boats. We have built hundreds of whitehulls, Down East peapods and the sailing Delaware Duckys over the years. The Flying Point 21 is our foray into building larger powerboats. The inspiration for the FP21 came from a derelict hull I found on the south shore of Massachusetts in the late eighties. I was impressed with its seaworthy lines as well as its elegant looks. After storing it in a barn for 15 years, I decided to finish it and make a mold of it. A year and a half later we are proud to introduce the Flying Point 21. It is one of the most traditional designs on the market today to be outboard powered. Its distinguishing features are a very deep forefoot for a soft ride in chop combined with a flat aft section for stability and easy planning performance with minimal power. Speeds in the mid 30s are reached with only a 75 HP outboard. The boats are proudly built in Maine in a small shop at the head of Penobscot Bay. With over 30 years of custom boat building experience, we are able to offer the FP21 in any degree of completion from bare bones to yacht finish. Your boat is custom built to your specifications. We offer engine and trailer packages at very competitive pricing. The top quality construction, gorgeous lines and superb performance make the Flying Point 21 a boat you would be proud to own. Please call for more information. Console to include grab rail, windshield, Teleflex steering SS wheel, switch panel, cooler seat, lights, bilge pump and SS hardware. Same as above but with colored hull, deck and bottom paint. Add $1500.